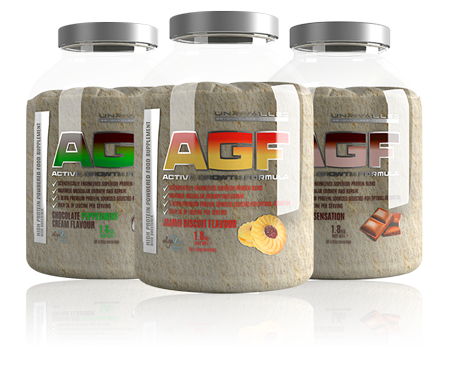 AGF (Active Growth Formula) is a scientifically specific, superior formula of undenatured time released proteins. AGF is designed to promote a significant increase in muscle mass and plays a major role in muscle maintenance and repair. This innovative formula is high in all essential amino acids with added revolutionary fermented BCAA’s. This groundbreaking formula also contains Algavia, a protein rich whole algae which delivers a rich collection of fibre that can be use in the promotion of gut health. The Cold Processed Micellar casein used in AGF is a slow digesting protein that contributes to amplified nitrogen retention. Increased nitrogen retention is essential for muscle and physical performance. The bioactive peptides in the cold processed micellar casein can also stimulate anabolic hormonal production. The sustained release of amino acids provided by the cold processed micellar casein can be vital in the manufacture and repair of muscle tissue. This makes the cold processed micellar casein in AGF ideal for muscle building and muscle repair. AGF incorporates the healthiest, most anabolic undenatured whey protein currently available. Whey Protein contains a full spectrum of amino acids and is a great source of BCAA’s including Leucine, well known for its key role in muscle synthesis. Only a totally undenatured cold processed whey protein can provide the bioactive properties of immune system support and glutathione production. AGF boasts a unique level of nutritional support and antioxidant properties for the hard training athlete. Cross Flow Micro Filtered Whey Protein isolate is one of the fastest acting proteins available, therefore one of the most advantageous proteins for triggering the muscle building repair process. The whey protein isolate used in AGF is of the highest biological value we could find and extremely high in BCAA’s. Hydrolysed Egg White has one of the highest biological values of any protein. It is fast digesting, low in fats and carbohydrates. After consumption this rapid digestion leads to a large increase in plasma amino acids which causes a correspondingly large muscle building response. Algavia is a protein rich Whole Algae delivering a complete protein containing all essential amino acids and a unique set of functional and nutritional benefits. Algavia contains a rich collection of fibre which can be used in the promotion of gut health, the healthier the gut the increased likelihood of superior protein absorption. Algavia also contains healthy lipids and an abundance of micro nutrients and is free of all known allergens. Standard BCAA’s are manufactured using a very harsh chemical and heat extraction process. The significantly more expensive process of fermentation uses no harsh chemicals or extreme heat exposure. Superior fermented BCAA’s are plant based and boost AGF to over 3g Leucine per serving.